A new study questions the efficacy of treatments for depression based on stimulating brain areas with low-intensity electric current. The technique, known as transcranial direct-current stimulation (tDCS), was considered a promising alternative to treatment with antidepressant drugs. In the new study, researchers at the University of São Paulo's teaching hospital (HU-USP) and the Psychiatry Institute of Hospital das Clínicas (HC-FMUSP-IP), the largest general hospital in Brazil, describe a trial in which they found tDCS to be less effective than escitalopram, an anti-depressant. The team of researchers led by André Brunoni, a professor in the Psychiatry Department of the University of São Paulo's Medical School (FMUSP) and director of HC-FMUSP-IP's Interdisciplinary Neuromodulation Service, randomly divided 245 patients with depression into three groups. 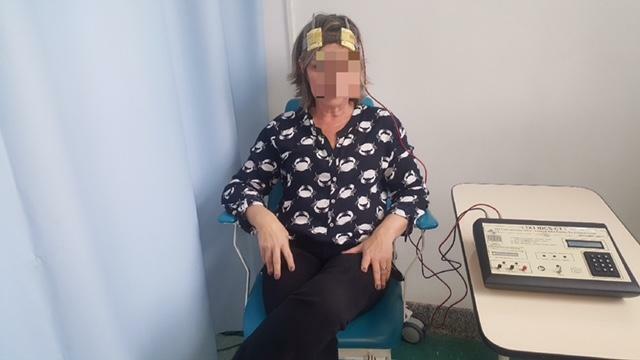 One group was treated with tDCS plus oral placebo, the second received sham tDCS treatment plus the anti-depressant, and the third received sham tDCS treatment plus oral placebo. The tDCS treatment was administered in 30-minute sessions for 15 consecutive weekdays, followed by seven once-weekly sessions. Escitalopram was administered at a dose of 10 mg per day for three weeks and 20 mg per day for another seven weeks. "We defined non-inferiority of stimulation compared with medication as at least 50%, meaning that tDCS would have to be at least 50% as effective as the anti-depressant, but this wasn't the case," Brunoni said. The study was supported by the São Paulo Research Foundation (FAPESP) through its Young Investigators Awards program. "We found that treatment with tDCS was not half as effective as treatment with escitalopram and concluded that transcranial stimulation cannot be recommended as first-line therapy. The anti-depressant is easier to administer and much more effective. On the other hand, tDCS performed better than placebo in our previous studies." About 12%-14% of the world's population is estimated to suffer from depression, and it is relatively easy to find self-help websites with videos showing how to administer tDCS at home. "It's very striking," Brunoni said. "These sites that claim to show how to stimulate your brain represent a huge risk for patients with depression. 'Do-it-yourself' solutions are strongly contra-indicated. In fact, they're dangerous. I expect our study to have an impact on this phenomenon because we've proved there are adverse side effects and that it's not as effective as many people think." The tDCS device is connected to a headband with twin electrodes placed on the patient's temples so that the current runs through the dorsolateral prefrontal cortex, an area with diminished activity in depressed people. "People with depression display cerebral hypoactivity, especially in this brain region but also in others," Brunoni said. "The action mechanism of stimulation was believed to increase brain activity in this region, but no such effect has yet been proven." Other techniques designed to change the brain's electrical activity include transcranial magnetic stimulation, transcranial alternating-current stimulation, deep-brain stimulation and focused ultrasound. "Of these, only transcranial magnetic stimulation and electroconvulsive therapy are currently cleared by the Food and Drug Administration [FDA] for the treatment of depression, and deep-brain stimulation has a humanitarian device exemption for the treatment of obsessive-compulsive disorder," writes Sarah H. Lisanby, director of the Division of Translational Research at the US National Institute of Mental Health (NIMH), in an editorial in the same issue of the New England Journal of Medicine. Lisanby highlights the study performed in Brazil and argues that parameters are needed to measure the functioning of tDCS. Brunoni agreed. "There are no parameters that enable us to know whether the tDCS dose is right," he said. "I know two pills are a higher dose than one. Moreover, some drugs can be measured in the bloodstream. The most common example is lithium. You can dose magnetic stimulation. In electrical stimulation, however, it isn't what you see. It's a very weak current that can be altered even by anatomical aspects in each patient." Brunoni is currently a visiting postdoctoral fellow at the University of Munich in Germany, where he plans to finish analyzing data collected from his clinical trial. "We collected a large amount of blood, genetic and neuroimaging data during the study," he said. "I'm going to finish analyzing all these data and investigate whether there's a patient profile with an optimal response to the treatment. Clinically speaking, there doesn't seem to be such a profile at first glance, but less-refractory patients who have never tried treatment before are thought to show a better response. I also plan to question the stimulation parameters themselves in order to try to discover whether there's a type of depression that responds more readily to this kind of treatment."